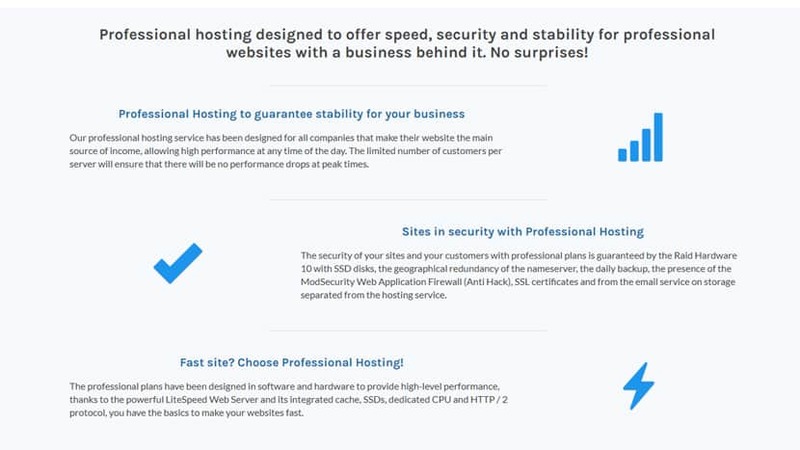 VHosting Solution Review 2019: Is VHosting Solution a Good Hosting? VHosting Solution is an Italian web hosting company with data centers in Italy, Germany, and France. This hosting provider targets small and medium-sized businesses in Italy and the rest of Europe. VHosting Solution is an Italian web hosting provider. With three data centers across Europe, they’re one of the top 20 biggest hosting companies in Italy. VHosting Solution offers low-cost yet reliable web hosting, premium shared hosting with a “no overselling” policy, specialized CMS hosting, VPS, and managed and unmanaged dedicated servers. Their website is available in two languages: Italian and English. VHosting Solution uses RAID 10 arrays for their 300Gbit network (RAID 1 if you’re on their budget shared hosting plans) and dedicates 1Gbps to each of their servers, making the vendor an excellent choice for small and medium-sized businesses looking for a combination of speed and reliability. Also, to secure their email services, this vendor uses dedicated email storage separate from your website storage, so you won’t have to worry about your emails eating up space meant for your website. Note that while VHosting Solution claims that customers can create an infinite number of email addresses on their platform, most users find themselves only able to control up to four email accounts from IMAP due to certain limitations the vendor has placed on their servers. To get the limit lifted, users have to contact the vendor and make the request. VHosting Solution has three strategically-located data centers in France, Italy, and Germany, thus ensuring optimal coverage across Europe. However, note that if you’re accessing their service from their English website, you’ll only have the German data center available to you. Also, while VHosting Solution has made an effort to translate their website to English, there are certain sections of the website that are available only in Italian. These include the email service webpages and the Terms and Conditions webpages. VHosting Solution compares favorably to other hosting vendors in Italy. They’ve got several wallet-friendly hosting plans that, unlike those of most other vendors, still have a good number of features that would perfectly serve a small website. The downside is that this vendor’s most expensive shared hosting plan still has some notable limitations, including a cap of 10GB storage. That said, they do have VPS and dedicated server packages available, so if you find yourself outgrowing their shared hosting plans, you can always upgrade. VHosting Solution doesn’t have a free plan available, but they do offer a 30-day money back guarantee. To contact the VHosting Solution technical support team, customers can use the phone number listed on their website, their client portal, email, fax, and the company’s social media channels. They also have Skype support and a live chat available during office hours from Monday to Friday. Their email support and client ticketing portal are available 24/7. Sadly, VHosting Solution’s FAQ section doesn’t contain a lot of helpful information, but in my experience, the VHosting Solution support team has an impressive ticket response time of less than ten minutes. They come across as sufficiently knowledgeable about hosting and go out of their way to help customers. For SMEs across Europe looking for a combination of affordability, reliability, and excellent support, VHosting Solution is a top contender. Larger corporations, however, would be better served by bigger hosting vendors that have the infrastructure to handle complex websites and resource-intensive databases. Wondering how VHosting Solution stacks up against other Web Hosting companies? Enter any other Web Hosting company and we will give you a side-by-side comparison.